Moravian rabbi; born at Cracow about 1600; died at Nikolsburg Jan. 2, 1661. His teacher in the Talmud was Joel Sirkes, author of "Bet Ḥadash." 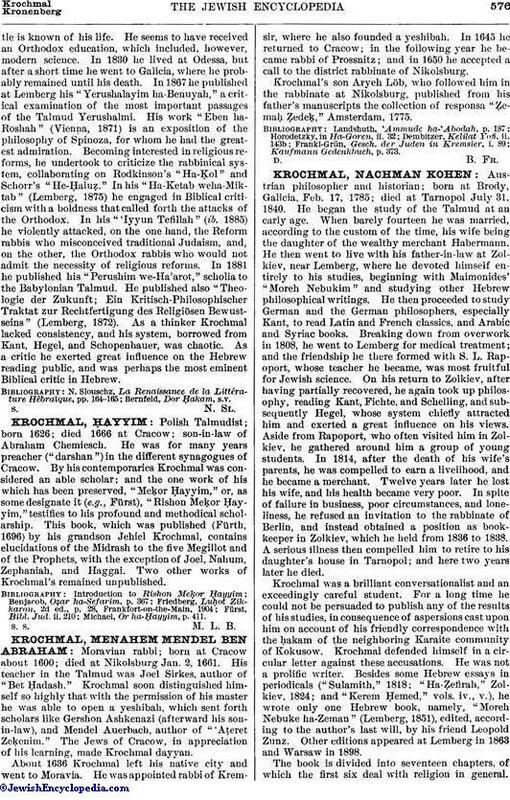 Krochmal soon distinguished himself so highly that with the permission of his master he was able to open a yeshibah, which sent forth scholars like Gershon Ashkenazi (afterward his son-in-law), and Mendel Auerbach, author of "'Aṭeret Zeḳenim." The Jews of Cracow, in appreciation of his learning, made Krochmal dayyan. About 1636 Krochmal left his native city and went to Moravia. He was appointed rabbi of Kremsir, where he also founded a yeshibah. In 1645 he returned to Cracow; in the following year he became rabbi of Prossnitz; and in 1650 he accepted a call to the district rabbinate of Nikolsburg. Krochmal's son Aryeh Löb, who followed him in the rabbinate at Nikolsburg, published from his father's manuscripts the collection of responsa "Ẓemaḥ Ẓedeḳ," Amsterdam, 1775.